Inner Rambling of a Mid Life Mama. 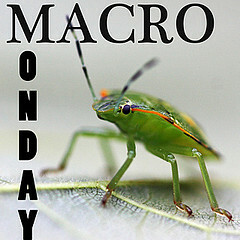 : Macro Monday. Ohhhh this is awesome. I have found a new obsession... well not exactly a NEW obsession but a new channel for one of my ongoing obsessions. Go check out Lisa's Chaos and join in her Macro Monday. I think I had seen it before but was denying myself the indulgence. Well... deny no more. I love macros and I'm proud to say it. This is one I took at the weekend, not my favorite but I feel it has to be at least recent to take part properly. The girls were making cupcakes with Nanny and so I snapped a few pictures to record the moment, I adore the color of the icing on the cupcakes. I have cropped this but other than that it's right out of camera so no fancy footwork with the lighting or colors. Thanks Lisa, wish I had joined in earlier, have been such a slacker lately but this is a whole new inspiration for me, just what I needed!!!!!! p.s. I'm cleaning out my blog roll, I have been noticing a lot of peeps dropping out of the blogosphere which is sad but on the bright side it makes room for me to follow some new blogs and gain more inspriration. I love blogging, there's always something new around the corner so this is an opportunity for a bit of a clean up!!! They look fantastic! Great close up! BLUE chocolate ! Did you taste it ? Looks nice ! Those look really yummy. I'm glad to see you back! Love that picture! They look so yummy!! Love that color frosting! Yummy..